One of the many old habits I’ve resumed since returning to London is to buy my lunch from a branch of Eat cafe very close to my office in Southwark, on the south bank of the River Thames. I head up the stairs from my first-floor desk, leave the building by the second-floor entrance on Southwark Bridge, then cross the road before descending again to reach the cafe, on the riverside walkway. But a key aspect of the experience has unmistakeably changed in the four years I’ve been away in New York. The challenge used to be to dodge cars and trucks speeding across the bridge towards the City of London, the financial district. The task most days now is to pick a way between the long line of vehicles backed up across the bridge. The Southwark Bridge hold-ups are only one manifestation of a gradual worsening of traffic congestion across London in recent years. The problem has grown despite the gradual decline in traffic levels as a result of the Central London congestion charge and the general absurdity of bringing a private car into London. Average motor traffic speeds in London in the first quarter this year were down 3.9 per cent on a year before, according to Transport for London statistics, despite a 1.1 per cent decrease in the volume of traffic on major roads. I first noticed the change on July 7, the day I returned from New York. It took me and my family a good two hours from Heathrow Airport to reach our temporary accommodation in Stepney. Forced to take a taxi by the challenges of moving five suitcases and a bicycle, we sat in nose-to-tail traffic for nearly the entire journey. Yet I have the feeling I’m relatively rare among London cyclists in thinking that this congestion is a serious problem, which cyclists have at least as much a stake as others in having tackled. Most comments from cyclists about the issue on Twitter dismiss the problem as a reflection of motor traffic’s fundamental inefficiency. There has been particular anger over a flawed report by David Begg, a transport economist whom I’ve known for 20 years, that linked the delays facing bus passengers partly to the building of London’s segregated cycle superhighways on some roads. this look to people stuck in traffic jams. But, having cycled the past four years in New York, I worry about how present conditions might influence policy, particularly as Sadiq Khan takes over from Boris Johnson, champion of the superhighways, as mayor. I’ve lived, after all, through the long backlash that followed the departure from office of Janette Sadik-Khan, New York’s former pro-cycling transport commissioner, at the end of 2013. For most of the time I was in New York, few new cycling facilities were built and those that were constructed were insultingly inadequate. Those already in place were allowed to decay or become useless through non-enforcement of rules over parking or yielding to cyclists. As long as cyclists downplay or ignore the seriousness of London’s current congestion problems, the debate about how to tackle the problems will be left to others. The ultimate risk is that London’s authorities follow the lead of Ed Koch, New York’s mayor from 1977 to 1989. In 1980, concerned about high fuel prices, Koch installed high-quality protected bike lanes along many of Manhattan’s busiest avenues. Stung by criticism of their effect on congestion and modest use levels, he then went on to rip the lanes out again within weeks. His volte face was so complete that he even sought to have cyclists banned from midtown Manhattan altogether. I should stress, of course, that none of my concerns means I’m accepting the simplistic account of London’s congestion problem that attributes a significant role to the reallocation of road space to the cycle superhighways. Transport planners have known for many years that the number of lanes on a road has far less effect on its capacity than might be supposed. A large amount of congestion comes from motorists’ unnecessary lane-changing, which elimination of a traffic lane can actually reduce. It’s also clear - as David Begg tells me he now accepts - that the figure of 25 per cent for the reduction in road space is a ridiculous exaggeration. It’s also unmistakeable that the segregated superhighways are proving hugely popular as a commuting route. This past Thursday, when we moved back into our house in Brixton, I cycled in the morning rush south down the north-south cycle superhighway. I was astonished at the vast numbers of cyclists heading the other way, north into central London. Pelotons of 30 to 40 riders powered past me in clumps formed by the timing of the traffic lights. Much of the time, there must have been at least as many people using the narrow cycle track as using the far wider road for motor traffic. That striking result has been achieved only a few months after the cycle paths’ opening and before the two main cycle tracks have been extended as far as is eventually intended. It is clear, meanwhile, to anyone observing with an open mind that there have been far more dramatic changes on London’s roads than the handing over of a single lane on a small number of roads to cyclists. For example, the traffic that I dodge as I go to buy my lunchtime pie is currently made up far more than in previous years of heavy dumper trucks going to and from the huge numbers of development sites dotted across the City. The rise of Uber has produced a surge in the numbers of private-hire vehicles on the roads, which Transport for London has very little capacity to restrain. In the past week, I’ve cycled on multiple bits of road whose capacity was restricted for one reason or another. But they included road narrowings for work on both Crossrail, the project to build an east-west rail line right across central London, and the extension of London Underground’s Northern Line to Battersea. Both of the rail projects are generating significant construction traffic and forcing the narrowing of roads in a number of places. Nevertheless, I keep returning to the feeling I had as I sat in that taxi from the airport on July 7 as I sat in stalled traffic. 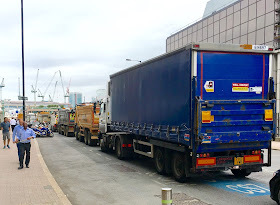 It was hard as I looked at nearly-empty, mid-morning cycle superhighways not to yearn for my taxi driver to turn onto the invitingly open stretch of tarmac to shorten our interminable journey. If I thought that as someone who would later the same day be cycling along the same routes, it’s hardly surprising if people with less stake in encouraging cycling feel frustrated at the current situation. If that feeling is not to end up leading to the abandonment of the superhighway programme, it is vital that something is done to tackle the on-street congestion. That, David Begg tells me, is the essential argument he was seeking to put across in his report in June on the impact of congestion on bus passengers. While much of the commentary around the report focused on the erroneous 25 per cent figure and some loose phrasing that Prof Begg tells me he also now regrets, it’s hard to escape the report’s central argument. Boris Johnson encouraged changes to the use of London’s streets that were bound to make streets more congested without having the courage to make anti-congestion measures like the congestion charge more effective. The former mayor instead did a great deal to exacerbate the congestion crisis by removing the congestion charge in Kensington and Chelsea. He also replaced high-capacity, articulated buses with the lower-capacity New Bus for London. If cyclists are not to suffer the consequences of Boris Johnson’s policy failures, it is vital that cycle campaigners start to recognise the nature of the competition under way for scarce road space. People who start cycling, after all, are mostly switching to riding from underground, rail or bus so are not self-evidently reducing the burden on the road network. Cycle campaigners consequently have to start noisily pointing out that the present crisis’s causes extend far beyond the installation of cycle lanes. It's also vital to start advocating for measures to manage other modes' use of that limited space. There’s a powerful case, for example, for charging lorries far more for entering central London in peak hours, for encouraging the shift of far more short-distance deliveries by bicycle, rather than van and for installing new, better-protected bus lanes to ensure buses don’t sit trapped in traffic created by demand for Uber and Amazon Prime. It’s absurd that neither taxis nor minicabs currently pay the congestion charge when they enter central London and it’s imperative that they start to do so. These are all sensible policy measures that I’d support even if I weren’t a cyclist. As a person interested in transport policy and determined in particular that bus passengers should get a better deal, I’m convinced on principle that it’s critical to come up with solutions to pointless, wasteful congestion. But an experience on Friday underlined to me how it’s also in cyclists’ selfish interests to deal with congestion. Coming back from a meeting on High Holborn, I rode my way through the quiet urban oasis of Lincoln’s Inn Fields and out onto Fleet St, seeking to make my way to the east-west cycle superhighway. I was greeted, however, with a scene of chaos, a nearly immobile wall of buses crowded onto the historic street, edging forward at well below walking pace. I was in the fortunate position that I could edge my way through cracks between vehicles the few hundred metres I needed to go, find an alley leading down to the Thames and escape to the generously-proportioned, fast-to-travel-on superhighway. I am conscious, however, that the passengers on the buses - a vital form of transport used disproportionately by the poor - lacked that option. They remained stranded as I slipped away. No-one who has London’s interests at heart can think such a situation should be allowed to persist. Regarding switching deliveries to cycles, at Cycling@Teatime, academic/logistics businessman Richard Armitage said that 1/4 of urban deliveries could be made on bikes and trikes. Thanks for the comment. Your initiative does indeed sound a worthy one. I refer to the Bicycle Blueprint for New York City (TA - downloadable - someone at Sustrans probably still has my copy!) on bike freight 90% of packages delivered by courier vans weigh under 30Kg. Probably the reason that Worksman Cycles of Ozone City is over 100 years old and still going strong and UPS deliver in NYC with cargo tricycles. Across the UK most cities nnow have cycle logistics operations. York perhaps the oldest with the company (originally Cyclone) contracting to most of the mainstream van courier operators. In Cambridge Outspoken has a transfer depot and moves 70% of courier deliveries in the city centre. In Glasgow the Outspoken franchise has grown from 1 man and a cargo bike to a team with many regular contracts, such as 'local' magazine/media distribution. Jeff Screeton has now been working with rail operators, filling off-peak space with high value parcels travelling at 125mph between cities where the first and final mile is efficiently covered by bikes and small (often electric) vehicles. Smart suppliers of stationary and ironmongery need to sharpen their act too their current on-line ordering - with every item shipped overnight from a centrally located warehouse (and 12-24 hr lag) pales against my ability to 'order' tools in Birmingham at midday and have the courier waiting with the order for me at the site offices at 12.45 - Thanks Steve and Cycles4U. I've even saved a day's time with the boiler installer, as he needed a particular part to complete the work - on the bike to Tool Station and 25 minutes later we had avoided a return visit the next day. One key detail delivers this - cost savings. No fluffy environmentally friendly stuff, just plain economic sense. Hi Dave. This link will give you the entire "Bicycle Blueprint" (pdf): http://www.komanoff.net/bicycle/Blueprint_complete.pdf. Enjoy. -- Charles. You say that minicabs should pay the congestion charge. I agree. I also think residents' discounts should be abolished (locals' vehicles congest just as much as outsiders', so although politically difficult I don't think there's a sound policy reason for retaining a discount). Any particular reason, however, why you don't think black taxis should also pay the congestion charge? Thanks for the comment. I don't think black taxi drivers should have a special exemption from the congestion charge while minicab drivers have to pay it. I've changed the copy to reflect that. I mentioned minicab drivers alone because the congestion charge is far more likely to influence their behaviour. Black cab drivers spend nearly all their time in the central charging zone and will cross the boundary many times daily. For a minicab driver, there's a stronger chance the charge could influence his or her decision about whether to enter the zone at all. Traffic congestion is in nobody's interest. The only way to reduce congestion in London is to introduce a much more extensive system of road user charging. Unnecessary driving needs to be discouraged, and doing so by charging people is preferable to allowing congestion to become intolerable. Road user charging will also generate valuable income which can be used to improve the roads. I don't agree much more extensive charging is the "only way" to reduce congestion. I suggest a few others as well, such as more space-efficient buses. But I definitely think there should be more widespread, sophisticated congestion charging and I hope someone will have the guts to introduce it soon. Re you observation about buses in Fleet Street, until recently I worked there, 20 years just south of the street and 8 years just north of it. The issue with buses is relatively recent, say the last 5-6 years, but my daily run across the street from The Cheshire Cheese to Wasabi for my lunch frequently entailed a heart-stopping dodgem between two walls of buses. (The problem is almost entirely on the eastbound side). You could often see literally a wall of double deckers all the way from Ludgate Circus past the Royal Courts of Justice and into Aldwych, two layers thick. My admittedly anecdotal impression was that half those buses had no more than a couple of passengers on board and the other half had none at all. Similarly, a non-overlapping half were tour buses of the open-top variety, rather than scheduled route buses. Buses do not, by themselves, cause congestion, but there are clearly gross inefficiencies in the way they operate, which I imagine are influenced by the financial provisions in their franchises. It's true that London bus operators are paid not according to how many passengers they carry but according to whether they meet TfL's quality provisions. There are also certainly some areas where buses don't carry many passengers. It would hardly be surprising if passengers mostly got off at the start of areas where traffic is slow, such as Fleet St. But London's buses mostly, as far as I know, remain relatively well utilised and are an efficient use of road space. There's room for improvement. But, if we're not going to agree with taxi drivers who take pictures of Cycle Superhighways at 2pm and say they're a waste of money because they're empty, I'm not sure I'd apply the same logic to buses. I read in one relatively recent TfL document that I found online that average bus occupancy in London is 19 passengers, which sounds quite good. The "Professor" bit in David Begg implies that he is an academic. It is no good therefore saying he now regrets his inaccurate statements about space given to cycle lanes, he should have done his research properly, and had his facts checked. Whatever happened to peer review? Frankly I would expect better from a professor. He has, in one community at least, commpletely blown the credibility of his report by accepting such dodgy "facts" and propositions and incorporating them in his findings. He has also drawn attention to the fact that he is not entirely independent in making such observations, as his CV will show. Your comment has made me realise that a big part of the reason I wanted to write this blogpost was my profound irritation at the way a lot of people who know almost nothing about David Begg have talked about him after this controversy. David started a transport studies course at Napier University in Edinburgh more than 30 years ago. I first met him when he was chair of transport for Lothian Regional Council in the mid-1990s and I've been in touch with him on and off ever since. The people who are now sneering at him don't seem to have much idea what David has accomplished over the years. I first interviewed him for a piece for the Scotsman about why he was taking away space from cars in central Edinburgh and handing it over to pedestrians and cyclists. He was facing absurd levels of criticism over this step, which was well ahead of its time, but he withstood it. He went on to run the Commission for Integrated Transport under the Blair government and continued to argue, powerfully and effectively, for a transport policy that reduced car dependence, cut down pollution and encouraged use of walking, cycling and public transport. It is in no small part his doing that it has become the orthodoxy in British public policy to support increased dependence on walking and cycling. He put his money where his mouth was. I used to run into him cycling around Edinburgh and he used to cycle daily to work at Cfit. David's focus on evidence-based public policy making has played a huge part in influencing my thinking and the arguments I make on this blog. I saw David recently for the first time since returning from New York and told him how I'd manage to cycle to our meeting in Victoria from Limehouse in half an hour. "Did you use the superhighways?" he asked. "They're great." The paper that's causing all the fuss was a single piece of work for a bus industry association. It wasn't a piece for a peer-reviewed journal. David tells me he bitterly regrets that he accepted a dud figure and used some loose language. He regrets that people are interpreting it as criticism of cycle superhighways. He intended it as criticism of the decision not to price London's roads more intelligently. I certainly don't agree with your insinuation that he wrote what he did because he used to be a director of FirstGroup. He's also a former director of GMPTE, which hates private bus companies. He's always had a portfolio career and, in my experience, been pretty ready to say things that aren't in his various employers' direct interests. But the nub of the issue seems to be this. I've now seen quite a few cycle activists claim that a single wrong figure and some loose language somehow discredit entirely someone who's spent decades doing more for sustainable transport than the rest of us will achieve put together. That's an astonishingly ignorant reading of this situation, in my view. If people genuinely think that, it says more about them than it does about David. But it's also not tactically smart. David continues to have the ear of a large number of influential people in transport, thanks to his long record of achievement. It would be a far better idea for cycling activists to contact him to talk this over and work with him than to rant about his somehow being discredited. Has anybody ever put together an effective list of solutions and examples used around the world for reducing congestion? 7) Capping of parking. Cap, then build underground parking, forcing removal of on-street parking. 8) Filtered Permeability. Making all residents streets access only for vehicles. 9) HGV bans during rush-hour. 10) Free School buses (20% of rush hour believed to be school run). 11) School exclusion zones (prevent the school drop off). 12) No through route for vehicles through the centre of a city. (Assen etc). There must be a design pattern book in here somewhere. "101 ways to solve congestion"
I don't know of any such list but it could certainly be interesting. It's worth having a look at http://evidence-project.eu/. It provides links to 22 evidence reviews - each one with an accompanying summary - outlining what is known about the effectiveness of various policy interventions to reduce reduce motor-vehicle use and/or promote sustainable transport alternatives. Congestion charges seem like the most-obvious solution, but they also seem to be unpopular with motorists. And in the Boston (US) area, with scarcely any separated infrastructure, automobile congestion is a safety enhancement; slow-moving cars are less dangerous than fast ones. Thanks for the comment. It was widely assumed before 2003 that Londoners would never accept the congestion charge. It's now a hugely successful fact of London life. A big part of the success, however, is that it covers an area of central London into which few people really need to drive. So the benefits are clear to pretty much anyone who comes into central London, while barely anyone pays the price. On the safety point, meanwhile, I don't think congested traffic is a particularly safe environment. The approach in London has been to reduce demand to drive into London then use the freed-up space to put in bus and cycle lanes and widen sidewalks. That seems like a pretty compelling policy proposition to me. In a vacuum, slow-moving cars certainly pose less of a threat to pedestrians and other road users. A common misconception is that it is also safer on a wider scale. But congestion usually being indicative of high traffic volumes, congested roads are actually more dangerous. More vehicles on the road means a higher probability of a crash. I think you’re over simplifying to say that cyclists don’t think congestion is a problem - this came in part out of our conversation on Twitter, which is a terrible forum for complex discussions. Cycling in London you can’t (yet) avoid interactions with motor traffic. If it’s backed up getting through on a bike takes longer, drivers are frustrated, angry and take less care. *Necessary* journeys by motor vehicles take longer. Air quality is worse. I don't think anyone will really deny congestion is a problem. The disagreement is over the solutions. The LTDA and bus lobby would halt any further segregated cycle infrastructure and rip up what’s already in place whereas many of us who already use bikes for transport think that a large scale roll out of further segregated infrastructure is the next step. The question then becomes which of those motor vehicle journeys are *really* necessary and how do you eliminate the others. It’s no secret that the ‘near market’ for bike use isn’t car users but public transport users. Freeing up capacity on Public transport by moving people to bikes (on segregated lanes) is way cheaper than expanding PT capacity. It’s no coincidence that CS7 follows the route of the overcrowded Northern Line. "John Musk….. drives to work but says “the biggest impact of the roadworks is trying to get to the West End for client meetings. It simply isn’t an option these days to use the Embankment route as it can take 45 minutes in a cab, and the Tube is far more convenient". Outside Zone 1 as a commuter from Brixton you can clearly see the volume of single occupant private cars that fill Brixton Road in the mornings and evenings. Many of those drivers appear to be commuting within London by car, even if not into zone 1. Taxis, whether Black Cab or PHV need to be reduced. Uber has driven down the cost/increased the convenience so that for 2 or 3 people travelling together they are competitive with public transport for many journeys. That’s not desirable from a congestion viewpoint so, since it’s not practical to significantly lower the cost of public transport, the cost of PHV travel needs to increase which means either limiting supply of available vehicles or some form of road pricing so individual journeys have a higher cost. Congestion charge for PHV’s would need to be a lot higher than the standard rate to make a material difference to the cost of an individual journey. Buses. Remember that trying to increase bus use without segregated infrastructure will result in slower bus journeys as well as that usually means bikes in bus lanes. Fleet Street I remember being thick with buses c20 years ago (which may be accurate - http://www.dft.gov.uk/traffic-counts/area.php?region=London&la=City+of+London shows City traffic levels have dipped since then). Surely if it is wall to wall buses then the issue is just too many buses rather than any traffic displaced from embankment? There’s no infra on Strand/Fleet Street/Ludgate (yet) and the only direct interaction is crossing the N-S superhighway at Farringdon Street. Oxford Street is a bus sewer which has nothing to do with cycle infrastructure or Uber as it’s buses and black cabs only. Something needs to change - perhaps a wholesale re-design of routes. It feels to me like we have far too many long distance bus routes that cross Zone 1 when they should terminate on the edge. Do the timetables frequencies work - are buses travelling empty when they don’t need to? Eliminating bendy buses was a populist measure that reduced capacity. They weren’t great around bikes but segregation was the solution. The issue with the number of private hire vehicles, I understand, is that the government has declined to allow TfL to restrict the number of private-hire licences. Anyone who meets the standards can become a private-hire driver. It seems to me that only a more comprehensive system of per-mile road user charging in London can truly rein in the growth of Uber and so on if that policy continues. If the number of drivers were restricted, I suppose the cost of using for-hire services would increase, which I wouldn't mind. But it might also encourage more illegal taxi services, which I wouldn't like. As for buses, I think it's easy to say the whole network should be redesigned but hard to say how it should be. Buses are popular with poorer Londoners because they're cheap and because they provide door-to-door journeys. Ideas that suggest passengers should be thrown off and told to get on the underground neglect that. As for what's causing conditions on Fleet St, I don't think it's to do with Embankment. I think it's caused by the general gridlock over much of London. But the issue is complex. Once buses slow down, they become less attractive and start to bunch together. Passengers will also simply get off and walk when buses slow down to walking pace. So the fact one sees buses sitting in traffic with barely anyone on board doesn't prove there was never enough demand for them, merely that the passengers responded to the slowing either by never boarding or by getting off when they slowed down. As for bendy buses, I never bought the idea they were bad for cyclists. It was pretty easy not to get inside them on a bend. Open rear-platform buses are a far bigger problem but attract less criticism. So, have you become a Boris fan? As you'll have gleaned from the piece, I think Boris introduced one excellent transport innovation - the segregated cycle superhighways - with the same lack of judgement and failure to plan that he brought to lots of other areas. So he failed to take necessary measures that would have made the cycle superhighways even more of a success. Then he went off to encourage people to make the UK's biggest foreign-policy mistake since at least the Suez Crisis. So, broadly, no: I've not been won over. I'm pleased to see that David Begg has acknowledged that his bus industry report was a flawed publication. However, I think he would be well advised not make this known via a single journalist. He would do most to restore his reputation if he made a public statement acknowledging that the 25% figure was an error, thus clearing the air and setting the scene for a reconciliation between Professor Begg and the UK cycle campaigning world. Perhaps he could blame the expensive 'reputation uplift' specialists from Greener Journeys' PR agency who failed to spot this howler before publication. Unfortunately Professor Begg's report has done actual damage to the prospects of cycling in London as cabbies, local press outlets and local councillors, as well as the Guardian via Dave Hill, have uncritically spread the flawed figure, bolstering the lie that bicycles cause pollution and congestion. This is why a public statement by Professor Beggs is essential for our campaign, so that when, as will happen, someone in opposing cycle or other schemes cites the 25% figure, we will be able to point to Professor Begg's own statement withdrawing the claim. I approached the London Cycle Campaign suggesting that David write a piece for their magazine putting the record straight. They essentially told me to get lost (in very close to those terms), on the grounds that their magazine wasn't a prominent enough platform for the public grovelling they expected from him. This business really has been marked by an extraordinary bullheadedness on the part of people who should know better. "Extraordinary bullheadedness" strikes me a bit of an exaggeration and it would be better to avoid this sort of jibe. The truth is that, at first, a lot of people automatically defended Prof Begg, but when they read the report &/or my blog-critique of it (and the blog-critiques of others) there was widespread sadness among those who knew him and his work, which is why it would be good if he came out publicly about the report's flaws. It would be especially good if the Professor could make public the point you make in answer to another comment, namely that he regrets that the report is written in such a way as to appear to be against CSHs while he actually supports them. It is not sufficient for me to say, 'a journalist claims Professor Begg has said he supports CSHs', but if he made a public statement (for example by a press release) of supporting them and that his report should not be interpreted as against them, it would be possible to present that statement to future opponents about the critical role cycling can play in reducing congestion and pollution (along with other measures). Thanks for the comment. I think I'm capable of deciding how to describe the response I received from London Cycling Campaign and it was extraordinarily bull-headed. As I pointed out above, David Begg has done far more over a distinguished career for sustainable transport than the rest of us will do put together. He's easily contactable via Transport Times and I've said what he told me and how I sought to have it more widely publicised. That's about as much as I can do with a blog I write in my scarce free time. I don't think anyone but me has approached him about this issue and, because he's not on Twitter or Facebook, I think he's not even fully aware of the extent of the stink. Carlton Reid & Peter Walker have also spoken to him at an earlier stage in trying to identify Professor Begg's source for the notorious 25% claim which turned out to be from a conversation with Cllr Vincent Stops of London Travel Watch who apparently misreported what he heard at a TfL briefing. Cllr Stops & Cllr Krishna subsequently tweeted about and citing Beggs!. Such is the British way with these things. I had heard that Carlton Reid planned to get in touch with him but David has no recollection of hearing from him. I'd commend listening to https://www.youtube.com/watch?v=3BrjxYjsxCk where Douglas McWilliams explains a lot about London's woes. e-mail me and I'll share some of my matrices on transport issues - Oxford Street for example where peak hour bus travelling average speed us 4.1mph - its faster to walk and the peak vehicle requirement on most routes is more than twice the standard vehicle requirement at the normal travel speed. For just one route that is over £4m of additional costs in buses and drivers. London Bus Services Ltd - the shell operator which does not appear to have an operators licence (unlike National Express Scottish Citylink and Megabus who do have one as the principal operator sub contracting to others for most of their services) currently has just over 8000 buses on their contracted total (although TfL Press office says 9000 ...?) but New York with twice the population has less than half the buses moving them. You rightly also note the stupid decision on articulated buses, which did not seem to carry out any objective review, using the CCTV recordings to analyse the claimed issues. On one route 87 'deckers (roughly 50% more road space used) replaced 37 bendies. Bus makers (in the UK) rubbed their hands as the Citaros (German Mercedes) were dumped. The claims that many rode free need to be tempered by the dact that many US cities have ride free zones downtown during the business day - as the cost of the extra buses (PVR at over £100,000/bus/year vs a % of fares not collected?). London might learn from Manchester, where their 3 city centre bus shuttles are free to use, as the service would cost more if fares were charged. There is a school thought that congestion is impossible to "solve" in somewhere like London as there will * always * be considerably more demand for road space than there is road space available. If congestion is reduced by some measure that frees up road space, then through the principle of induced demand, there will always be someone else only too willing to occupy the road space again unless the demand is limited in some way. The good thing about the new cycle lanes is that at least people on bikes shouldn't be affected by congestion on the rest of the road rather than drivers dragging everyone down to the same level of misery. If TfL really want to reduce congestion, then I think their primary focus should be on demand management and the tools at their disposal here are pricing (congestion charge, ULEZ) and regulation such as tougher requirements for private hire. A number of industry trends don't make their job easier - internet delivery services are in an arms race to offer even faster delivery times and that means even more vans on the roads. Convenience supermarket chains use vans like mobile stock rooms to maximise shelf space in their shops. Neither are really paying the true cost of the roads... "free delivery" isn't really free. Val Shawcross, Sadiq Khan's deputy mayor said that TfL were "stuck in a rut" when it came to bus services in central London. That doesn't really surprise me as I think some of the "bus men" in TfL can't see the wood for the trees and the monster they have created in some streets in central London with walls of buses going nowhere. I'm sure it won't be easy to sort out but hopefully there will be some recognition that the bus system is part of the problem in central London. Wouldn't increasing the congestion charge by X amount bring things back into balance? When even the Queen can't afford to be driven in London, few others would spend so much either. There's a balance somewhere between that and the current charges. Who needs a carbon tax? "There is a school thought that congestion is impossible to 'solve' in somewhere like London as there will * always * be considerably more demand for road space than there is road space available." That school of thought is patent nonsense, as there exist numerous counter-examples. There are major cities ranging from Venice to Utrecht that have definitely solved the congestion problem. Solved it by banning motor vehicles, or as with Venice, never having them in the first place. Although it is in theory possible to have pedestrian and bicycle traffic congestion, the reality is that these methods of transportation are so efficient that this does not happen. Or more accurately, the use of motor vehicles for transportation is so insanely inefficient that getting rid of them has, in every case, eliminated congestion. Please feel free to leave civilised comments - positive or negative - here. I'll try to reply too. Abusive comments will be moderated out and won't appear.